Former acting Attorney General Sally Yates was supposed to testify before the House Intelligence Committee about the obvious connection between President Vladimir TrumPutin’s campaign staff and Russian officials—that is, until, her attorney claims, the Justice Department applied the brakes. Yates’ lawyer, David O’Neil, accused the Justice Department of trying to silence Yates, who served as deputy attorney general in the Obama administration and then as acting attorney general in the first few weeks of the Trump administration, claiming that “all information Ms. Yates received or actions she took in her capacity as Deputy Attorney General and acting Attorney General are client confidences that she may not disclose absent written consent of the department,” the Huffington Post reports. 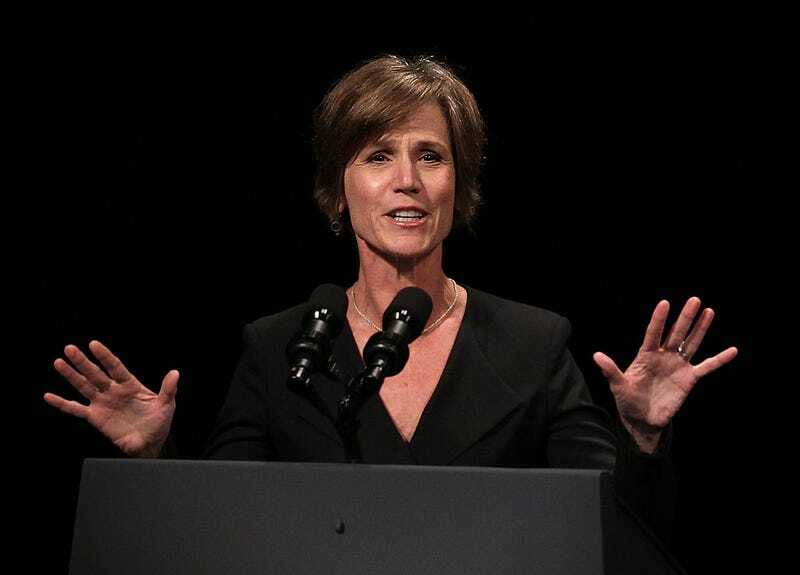 Yates was fired Jan. 31 after she refused to enforce TrumPutin’s Muslim ban. “We believe that the department’s position in this regard is overbroad, incorrect, and inconsistent with the department’s historical approach to the congressional testimony of current and former officials,” O’Neil wrote. O’Neil added that Yates’ testimony wouldn’t have revealed any classified information or violated any protocol, since other senior members have done the same thing. O’Neil was originally scheduled to testify Tuesday, but on Friday, hours after her attorney sent a letter to White House counsel Don McGahn informing him of what the Justice Department had decided, House Intelligence Committee Chairman Devin Nunes (R-Calif.) canceled the scheduled hearing, because of course he did. On Tuesday, White House press secretary Sean “Spicy Facts” Spicer issued a statement calling the allegations false. So let’s see if she added back to the list. My guess is, nah.